March 1943: Delivered to 94th Bomb Group, Smokey Hill Air Base, Salinas, Kansas. 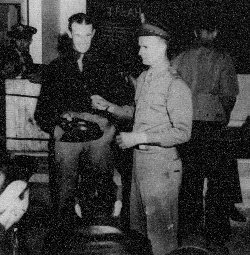 The assignment of the airplanes for the 94th Bomb Group was determined by the pilots drawing numbers from a hat. On 18 March the squadron planes began their flights to England. The bomb load explosed in St Omer instaed of the airfields. It was a sunny afternoon and everybody was outside. 113 civilians victims died. note: the only mission flown from Earles Colne for 42-29476 was the 29 May mission, as the plane was shot down near Champs Geraux. Rob "Bolling" Rawlison remembered the hecox crew as one of the most serious.